"Less than 1% of potential customers come to your website. Few sign-up, even less convert. It’s not a funnel, but a pasta strainer. 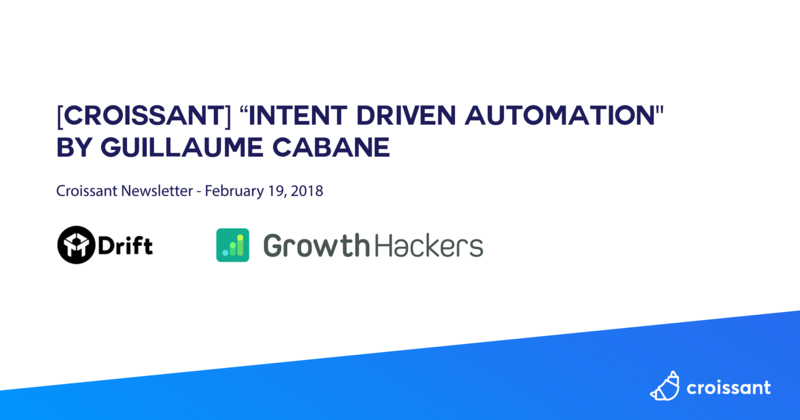 In the past Guillaume “G” Cabane has shown how to automate advanced marketing personalization once prospects land on a website. Now G will reveal his master plan and first steps towards automating marketing based on intent … before the website. Contacting the right people with the top companies, at the right time, through the best channel with the perfect message. At scale. " "Too often we think… “Growth = Automation Automation = Lower costs”. I think… Automation = Better Experience "
"Marketers use spray & pray because it’s cheap and they don’t know much about their contacts Knowledge is what changed in 2017 "
"It is now possible to know the quality of anonymous trafﬁc per source… and take action! " "In today’s fast-changing environment, organizations need to focus on Growth as a strategy, a culture, and a mind-set. As one of Skyscanner’s earliest employees, Yara Paoli has seen the company scale from a small Scottish start-up to a global travel meta-search player who last year, was acquired by online travel giant Ctrip for $1.7B. Yara shares how Skyscanner transformed itself from a traditional organization to a Growth organization and the pitfalls, challenges and imperatives along the way. " "For a long time, keyword rankings were a staple part of any SEO campaign. In a lot of cases they were a primary metric used to judge performance. Go back five or six years and we had so much more information on the keywords that users were searching for to reach our web content. All of this information was available transparently within Google Analytics, and you could get relatively accurate search volume estimates from within Google’s Keyword Tool. The first major update that changed this was Google move to encrypted search and the dreaded appearance of “not provided” within Google Analytics. This created a ripple effect across many SEO software providers that made a lot of their tools less effective -- or at least tougher -- to measure the impact coming from organic search on a granular level. " "I kicked 2018 off with a bold, self-inflicted challenge to write 30 blog posts in 30 days in a bid to increase adoption of our two new products, Popups and Sticky Bars. The initial thinking was to call this effort Product Marketing Month, with the content based on my journey to become a more proficient product marketer. As I shared at the start of the journey, the adoption of the new products had been disappointingly low; only 6% of our customers were using them when I first started looking at the numbers in August. That number was probably around 7% or 8% at the start of January. "You’ve definitely heard “demand generation” thrown around as a startup buzzword before, but let’s be clear in our definition before we start. Demand generation is the creation of systems that build awareness of, and a market for, your products with target customers. We can break this down into a few different elements to make it clearer: 1. Products: the actual things you sell. Customers: people who buy your products. 2. Systems: a combination of people, processes and technology that can run over and over again. 3. Awareness: knowledge of your existence and what you do. 4. Demand: interest in what you do and the value it creates. The specific demand generation system you build varies based on what type of product you sell and the customers you hope to attract. However, there are common themes to keep in mind as you sketch these out for yourself. "